WASHINGTON, DC -- The United States says it does not recognize the results of “so-called” referendums held on Sunday in eastern Ukraine, viewing them as "a transparent attempt to create disorder." White House spokesman Jay Carney offered the assessment at a press briefing on Monday, a day after pro-Russia separatists held votes in Ukraine’s eastern Donetsk and Luhansk regions claiming overwhelming popular support for the regions’ secession from Ukraine. "We do not recognize the results," Carney said. He expressed disappointment that Russia not only did not use its leverage to forestall the votes but that Russian media even attempted to legitimize them. He also expressed concern over apparent efforts to disrupt Ukraine's presidential elections, scheduled for May 25, saying that international efforts should now be centered on allowing Ukraine to hold a free and fair poll. 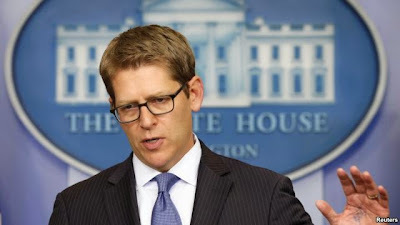 Carney gave credit to Kiev authorities for what he said were efforts to address grievances of residents of Ukraine's east through negotiations. Holding "illegal referendums" and "annexing parts of countries" is not a way forward, he added. Kiev and Western governments have been accusing Moscow of orchestrating the current unrest in Ukraine’s east and south. The pro-Russian separatist mayor of Ukraine’s eastern city of Slavyansk said on Monday his region needed Russian troops to provide stability and peace. Speaking a day after controversial referendums in eastern Ukraine, Vyacheslav Ponomaryov described Ukrainian troops there as occupiers. “They should go ... We're going to defend our territory,” he said in his sandbagged administrative building in Slavyansk, the most heavily defended rebel city in the east. Pro-Russian separatists in Luhansk region followed suit, the Associated Press reported. Similar moves precipitated Russia's annexation of Ukraine’s Crimea region in March. The call in Donetsk was made by Denis Pushilin, a leading member of the self-declared “Donetsk People's Republic,” at a news conference in the city. "Based on the will of the people and on the restoration of a historic justice, we ask the Russian Federation to consider the absorption of the Donetsk People's Republic into the Russian Federation,” he said. Pushilin said Ukraine, Belarus and Russia - states that formed the core of the now defunct Soviet Union - belonged in a restored historic union. The results of the Donetsk and Luhansk votes should be implemented peacefully, Russia said earlier, without saying what further action it might take. Meanwhile, Moscow has called on Ukraine's government on Monday to hold a nationwide debate of the country's future structure in light of the poll results in the country’s east. Kiev, EU denounce votes Ukraine's acting president, Oleksandr Turchynov, has slammed the rebel-held referendums as a "propaganda farce without any legal basis." However, he added that he wanted to "continue dialogue with those in the east of Ukraine who have no blood on their hands and who are ready to defend their goals in a legitimate way." The European Union has also condemned the votes as illegal. European Union foreign ministers added two Crimean companies and 13 people to the bloc's sanctions list, EU diplomats said. These are in addition to 48 Russians and Ukrainians who have already been targeted with EU asset freezes and visa bans. The EU ministers also hinted on Monday that any disruption of elections in Ukraine on May 25 could trigger new economic sanctions against Russia. But the EU remains far behind the United States in the severity of the sanctions it has imposed on Russia. Turchynov also accused Russia of working to overthrow legitimate state authorities in Ukraine on Monday after pro-Russian rebels declared a resounding victory in referendums in Ukraine’s Donetsk and Luhansk regions. Turchynov said the Kremlin was trying to disrupt a presidential election scheduled for May 25 which is taking center stage in a confrontation pitting Moscow along with pro-Russia separatists in eastern Ukraine against the government in Kiev and its Western backers. Ukraine's May 25 election is intended to secure democratic continuity and legitimacy after pro-Moscow president Viktor Yanukovych fled the country in February, and Western governments have threatened more sanctions in the vital areas of energy, financial services and engineering if Moscow disrupts the vote. Following Sunday's referendums, separatist leaders in Donetsk say they will form their own army and expect all forces affiliated with Kiev to leave the region. Ukraine’s government is already struggling with its anti-separatist military campaign and is reported to be short on men. Analysts say they fear the authorities are likely to rely on irregulars more and that the fighting could spread beyond the regions of Donetsk and Luhansk, which voted Sunday. Luhansk separatist leader Valery Bolotov said now that the plebiscites are over, his pro-Russian militiamen as well as separatists from Donetsk will start turning their attention elsewhere to help other regions agitate for a break from Ukraine. He said separatists will not enter into any talks with Kiev and that the only negotiations currently are about prisoner and hostage exchanges. They are trying to set up an information blockade and, with unbiased information closed off to viewers and radio listeners, run completely shameless lies,” Lavrov told a news conference. “The ambassadors in Moscow obviously see what Russian TV is showing in live broadcasts and I am sure they are obliged to report to their capitals the facts they see live. Otherwise they would be doing a totally unprofessional job,” said Lavrov. Russian media, most under direct or indirect government control, are widely viewed in the West as distorting news about events in Ukraine both for internal and external consumption. Russian state-controlled gas company Gazprom has reiterated its threat to stop supplying Ukraine with gas if it does not pay in advance for June deliveries, Russian news agencies reported on Monday. Gazprom says Ukraine owes it $3.51 billion and has warned in recent weeks that it would demand pre-payment for gas from next month. President Vladimir Putin warned European gas customers last month that deliveries could be disrupted if Gazprom cuts supplies to transit nation Ukraine.